Figure A23. Caroline Ridge anomaly, interpreted as the Caroline Ridge slab, with (horizontal) [vertical] cross sections through (A)[D] the UUP07 p-wave) and (B)[D] the combined SL2013 and S40RTS s-wave models at 610 km; C) the location of the modern geological record that we interpret to have formed during the subduction of the slab. 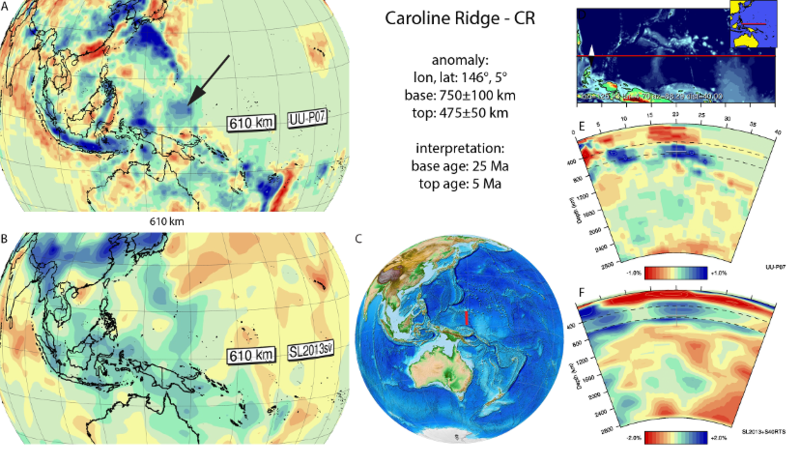 The Caroline Ridge anomaly (Figure A23) was identified by Hall and Spakman (2002; 2004) and is draped on the 660 km discontinuity below the Caroline Ridge, north of Papua New Guinea. It lies south of the Mariana slab, but according to the reconstruction of Hall (2002) is not directly related to it. (Hall, 2002) reconstructed an intra-oceanic subduction zone that accommodated Pacific plate subduction at the location of the Caroline Ridge anomaly initiating at ~25 Ma along a transform fault that accommodated clockwise rotation of an intra-oceanic subduction zone that rolled back southward towards Papua New Guinea, opening the Caroline Sea plate lithosphere in its back-arc position. This subduction zone came to an arrest at ~5 Ma according to Hall (2002). Wu et al. (2016) named this anomaly the New Guinea Offshore slab and suggested an age range of 25-10 Ma. We use the largest age range of these interpretations and adopt 25 and 5 Ma as the ages for onset and end of subduction of the Caroline Sea plate forming the Caroline Ridge slab.